US Secretary of State John Kerry has condemned the fact that the Syrian government used chemical weapons against its own people. John Kerry said footage of the alleged chemical weapons attack near Damascus was “real and compelling” and “undeniable”. He said President Barack Obama was considering a response. It comes hours after UN chemical weapons inspectors were fired on near the Syrian capital. The team was dispatched to one of the five sites around Damascus where hundreds of people were reported to have been killed on August 21. The Syrian government has denied launching any chemical attacks. Russia, a key Syrian ally, has strongly warned against Western military action in Syria. “What we saw in Syria last week should shock the conscience of the world. It defies any code of morality,” John Kerry said in a briefing for journalists on Monday. The US administration had additional information about the attack that it would make public in the days ahead, he added. John Kerry said the delay in allowing UN inspectors to the sites of the alleged chemical weapons attack were signs the Syrian government had something to hide. “Attacking the area, shelling and systematically destroying evidence is not the behavior of a government that has nothing to hide. 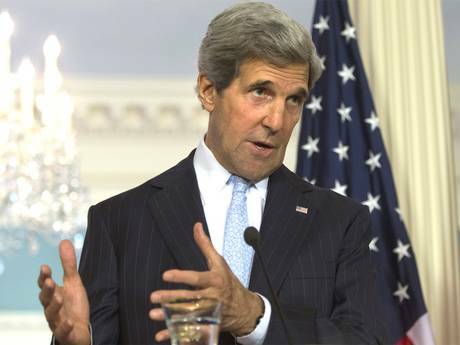 The regime’s belated decision to allow access is too late… to be credible,” John Kerry said. Russian Foreign Minister Sergei Lavrov earlier told reporters the West had not been able to come up with any proof of chemical weapons use. Sergei Lavrov was responding to suggestions from some Western countries that military action against the Syria government could be taken without a UN mandate.